Iran’s Supreme Leader responds to Kerry, suggests that the Americans “exercise self-restraint” and not attack his country. The comments were made in response to ones made last week by Secretary of State John Kerry, who said the military option was still on the table if Iran fails to live up to its part of the agreement that was signed with it in Geneva. 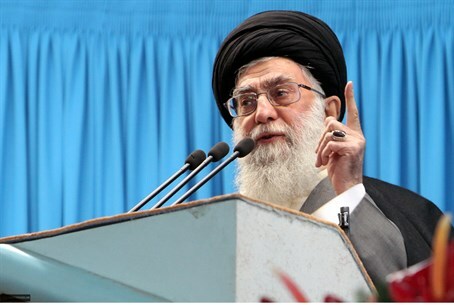 In the televised address which was translated by the Middle East Media Research Institute (MEMRI), Khamenei also referred to American-Jewish billionaire Sheldon Adelson, who said in October that the United States should “drop a nuclear bomb” on Iran. “Our top officials should pay attention to what [the West] is saying, because they smile and say that they are interested in negotiations, but at the same time, they say that all options are on the table,” said Khamenei, referring to Kerry’s statements. “Well, what exactly are these options? What kind of action – or mistake – could they possibly take against Iran? If they are serious, they should exercise some self-restraint. All those people who utter this kind of nonsense must be stopped,” he added. “Along comes some wealthy American statesman, who makes a mistake and says: ‘We should drop a nuclear bomb on some Iranian desert,’” said Khamenei in reference to Adelson. “He makes threats and so on. Such a man should be punched in the mouth and crushed!” he declared. Khamenei’s threats come several days after senior parliamentary officials in Tehran denounced Kerry’s remarks and threatened a “crushing response” if the United States attacked Iran.